Are smart cities a good options for property investors? "At present, prices in these cities are reasonable. The potential for price appreciation is high", says Prashan Agarwal, co-founder, PropTiger.com. Are smart cities good option for property investors? Smart phones have changed the way we live. From a tool for just voice and text communication, they have become the centre of one's life. Now, you can access internet to connect with others, watch movies, pay bills or carry out bank transactions from anywhere. A similar sea-change can be expected from the 100 smart cities that the government plans to build in the country. These state-of-the art cities will use technology to make life of its citizens more organised and less stressful. Even as the government is working on the plan, a few smart cities are already coming up across the country. These include Kochi Smart City, Gujarat International Finance Tec-City (GIFT) in Ahmedabad, Naya Raipur in Chhattishgarh and Wave Infratech's 4,500-acre smart city near New Delhi. We look at what these offer to know what the 100 planned cities may look like. Plus, we analyse if it makes sense to buy property in these places and how these projects have impacted property prices in and around the areas where they are coming up. Smart cities are defined by extensive use of technology to make life simpler and more comfortable, while being friendly to the environment. They are a solution to problems that residents of Indian cities face due to poor planning and maintenance. "In a smart city, infrastructure and amenities such as water, sanitation, energy, transport, public safety, education and health care are integrated and managed through technology for efficient governance and delivery," says Abhilesh Babel, joint-CEO, Realty and Social Infrastructure, Feedback Infra, an infrastructure advisory firm. "The essential features include smart parking and traffic management, smart grids, smart lighting, efficient waste management, etc," says Shivanand Samant, CEO, Supreme Housing. A smart city uses information and communication technology to provide public services more efficiently. "Integral to a smart city is information technology, where a network of sensors, cameras, wireless devices and data centres form the key infrastructure for providing services," says Vishal Malik, director, Coldwell Banker India, a property brokerage. Data are made available on a real-time basis for better planning and making policies which are forward-looking and help in sustainable development. 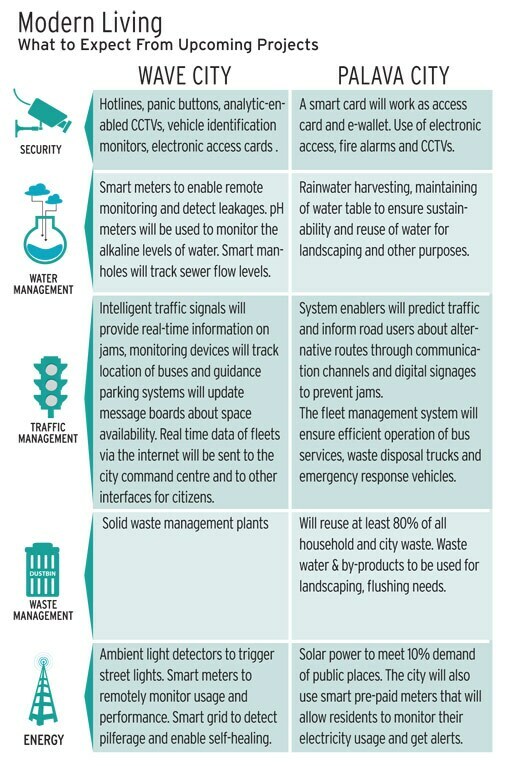 "A smart city runs on technology-be it electricity, water, sanitation, waste recycling or transport. The aim is to use data to provide effective solutions to residents," says Amar Sinha, executive director, Wave Infratech. Internationally, many cities have used technology for efficient use of resources. Barcelona is a case in point. The city's 2012 master plan includes projects such as remote control of street lighting and fountains and a programme that includes remote watering of the city's green spaces. The UAE is building a city, Masdar City, in Abu Dhabi, which will be a carbon-neutral and zero-waste city. Gujarat International Finance Tec-City (GIFT), Ahmedabad, to be developed over 900 acres, is billed to be one of the country's first smart cities. It will feature remote management of utilities from a single command centre, use of data analytics and real-time monitoring of services. It will provide high-quality infrastructure to woo finance and technology firms from places such as Mumbai, Bangalore and Gurgaon. It will have a special economic zone, an international education zone, integrated townships, an entertainment zone, hotels, a convention centre, an international techno park, Software Technology Parks of India units, shopping malls, stock exchanges and service units. Kochi Smart City is another such initiative, albeit over a smaller area of 100 hectares. It has a special economic zone that seeks to replicate Dubai's smart city project. Naya Raipur is also being built as a smart city. There are also plans to build seven smart cities along the Delhi-Mumbai Industrial Corridor. Wave Infratech is building a 4,500-acre smart city on NH-24, the newest suburb of Delhi, which will be managed by a central command centre. The proposed facilities include automated traffic signals, electricity and water meters custom-made to reduce bills, buses which will send text messages to inform residents of their arrival, mechanised garbage control, fiber optic connectivity, 24X7 security, panic buttons and CCTV surveillance systems. The 400-acre Amanora township in Pune seeks to integrate e-governance and security by having a dedicated internal portal and a multi-use smart card for identification, access and cashless payments. The card will also have the person's medical records for emergencies. Besides these, there are some cities which have the potential to become smart cities. "There are some well-planned cities which can be developed into smart cities. These are Chandigarh, Jamshedpur, Noida, Navi Mumbai, parts of the Greater Bangalore region, Mahindra World City in New Chennai, Lavasa (Lavasa Group) and Aamby Valley (Sahara Group) near Pune," says Anshuman Magazine, CMD, CBRE South Asia Pvt Ltd.
Malik of Coldwell Banker adds Gandhinagar, Pune, Delhi, Thiruvananthapuram, Nagpur and Bhopal to the list. Smart cities can be a good option for property investors. According to Sumit Jain, co-founder & CEO, commonfloor. com, places such as Kochi Smart City and Gift offer substantial scope for price appreciation. "At present, prices in these cities are reasonable. The potential for price appreciation is high. But the investor must have a long time horizon," says Prashan Agarwal, co-founder, PropTiger.com. "While these regions are considered good for investors and buyers, one must be cautious. Buyers with a short investment horizon (two-four years) must refrain from investing in these regions because most of these projects are in the implementation stage. It will take several years before they become reality. Further, site visit will give an added advantage as one has to look at on-ground realities rather than rely on promises," says Jain of commonfloor.com. Kochi Smart City has put life in the region's dull real estate market. "Kakkanad, where the city is coming up, witnessed big land deals, and prices shot up considerably. With construction under way, the region has seen steady price appreciation over the past few years. This is in contrast to other areas in the city where there has been a price correction. After a dull period in 2013, demand from the IT/ITeS sector is picking up, and one can expect 30-40% price appreciation over the next three years," says Jain. GIFT, currently under construction, has also had a considerable impact on prices in and around the area. Prices of apartments there are Rs 3,000-5,000 per sq ft. Certain localities in Ahmedabad such as Valad, Urjanagar and Chandkheda have seen good price appreciation (as much as 30-40% annually). Going forward, one may expect 10-15% annual price rise, says Jain. In Wave City, prices have risen from Rs 7,436 per sq ft in June 2012 to Rs 8,102 per sq ft in June 2014, a rise of 9%. In Palava City, the rise has been from Rs 2,643 per sq ft in June 2010 to Rs 6,032 in June 2014, an appreciation of 128%.